Today was the first time this football season that I remembered to wear my Chicago “C-shirt” while the Bears played. I’d like to think that it helps them in some miniscule way. The first indication that things were not going to go well, and that perhaps my wearing of said C-shirt is useless, came during the Bears’ game. Kyle Orton tossed a perfect spiral to a wide-open Buccaneer defensive lineman, who promptly returned it 45 yards for a touchdown. Bucs, 14-6. I kept watching and listening as I got ready for my soccer games. The Bears managed to take a 17-14 lead in the third quarter. As I drove to my soccer game, I tuned in to the Bucs’ radio network and listened as the Bears punched in another touchdown in the fourth quarter, pushing their lead to 24-14. Things looked good. Got to my game. We had only two subs, which was bad news because I get winded pretty quickly. Early in the game, one of their guys shot from the left. The ball rebounded off the keeper, I didn’t shift over fast enough, and they scored on the rebound. My fault—not a good feeling. We tied it pretty quickly at 1-1. A few minutes later, I assisted on a goal to put us up 2-1. A few minutes after that, I scored almost directly off a corner kick—the goalie wasn’t watching carefully, so I drilled it right at his legs from the corner, and it bounced into the net. We scored one more before the half, and were up 4-1. A goal and an assist, and I felt better. So, of course, right after halftime, my mark scored. He got the ball, I had him dead to rights, he shot and I didn’t get my foot down fast enough to block it. The ball stayed low and skipped off our goalie. 4-2. My fault again. One of our girls scored to put us up 6-2 (girl’s goals are two-pointers). Near the end of the game, I got the ball near midfield on the left wing. I beat a guy down the wing, took the ball down the goal line, drew two defenders and the goalie and… slipped the ball to a wide-open teammate in front of a wide-open net. He drilled it in, and we won 7-2. Me: one goal for, two assists for, two goals against. Meh. Our next game was to start an hour later. At my request, our team captain checked the Bears’ score on his cell phone, and he got this look on his face that said I wasn’t going to like the news. I asked, “Bears blew it, didn’t they?” He nodded. I guessed, “27-24?” He nodded. Just great. That’s back-to-back weeks that the Bears have blown 10-point leads in the second half. They should be 3-0 instead of 1-2. Oh well. Our second soccer game started late. The other team was good; everyone on their team (except the goalie) had a good first touch and was always looking to pass. They scored early off a header. Again, I should have been in a better position to clear it out. Midway through the first half, I won a ball in their half of the field, tapped it to a teammate who had a 2-on-1 (“odd-man rush,” for you hockey fans). He drew the defender, then tapped it to one of our girls, who slammed it home. We were up 2-1. They tied it at half-time, and I spent the first fifteen minutes of the second half on the bench. I finally went in up front, thinking this was my moment. Technically, itwas, but not the kind I had in mind. A minute or two after I came on, I got the ball wide-open on the left wing. As I received it, a defender came at me, leaving one of my teammates open in the middle. All I had to do was tap it over, and he’d have a 1-on-1 with the goalie. So I… somehow managed to kick the ball into my own ankle. Blown opportunity #1. Meanwhile, they scored to make it 3-2. A few minutes later, the ball was played long over my head to their right back. He tried to turn with it, and I took the ball, knocking him down. There was only the keeper to beat. He came at me with his legs spread too wide, leaving an empty net behind him, so I megged (v., Eng., deriv. of “nutmegged,” past tense of “to nutmeg.” Slang. To kick a ball between an opponent’s legs.) him. It went through–goal for me, right? Well, no. At just the right moment, the keeper swung his leg back, knocking the ball out for a corner kick. Blown opportunity #2. I sagged. Maybe I should’ve brought it in closer and cut around him. That should have been in. Meanwhile, they scored again to make it 4-2. With only a coupla minutes left, my teammate was dribbling along their goal line exactly as I’d done late in the earlier game. He drew the defender, he drew the goalie, leaving me open in front of the net. He tapped it to me, and… I barely tapped the ball. It trickled towards the net, and the goalie easily recovered and picked it up. Blown opportunity #3. We lost, 4-2. If I’d converted those chances, down 4-2 would’ve been up 5-4. I just sat in my chair and felt like crap for half an hour after the game. I finally got in my car and drove home in silence, stunned at how badly I’d played, angry that I couldn’t even take comfort a Bears’ victory because they’d choked, too. What an awful day. On the way home, I remembered that I needed to buy meat and bread for lunch. The deli was closed, so I had to buy the pre-packaged stuff at the grocer. I grabbed some bread, some roast beef, and some provolone. I walked past a display with all kinds of cheeses, dips and spreads on it. I got twenty feet down the aisle, and then I stopped. I felt a surge of hope. I’ll never know why, but thought, “Maybe I should go back to the cheese display.” No, that’s not quite right. You know how junkies feel about heroin, or how Frodo felt about the Ring? That’s what I felt. The cheese display was calling to me; I was obligated,compelled to go back. That’s right. 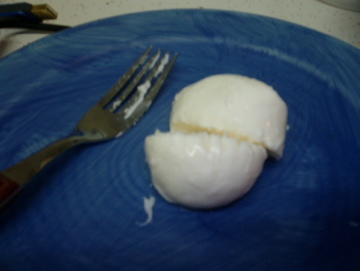 Bocconcini. 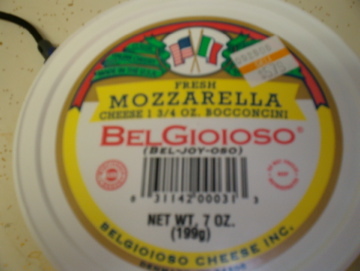 Bocconcini, right here in Jacksonville. Bocconcini, which I’d last seen a thousand miles away in a lifetime long past. Bocconcini, incontrovertible proof of God’s existence, and of His merciful love for us all. I need a new camera; it didn’t pick up the halo. And it only costs $13.23/lb? I never knew that manna could be had so cheaply. I assume your last encounter was in the Great Holy City of Chicago, spiritual home of the Most Righteous Ditka. I say that your miraculous encounter is a sign from Heaven – the Cubbies will finally win the World Series after 100 years. There is no joy in Chi-town, for the mighty Cubbies have struck out. At least there’s no joy in the north side. And the south side is hanging on by a thread. Posted in 2008, Uncategorized on September 21, 2008 by VDV.